If you purchase all four giclee series, we will include 30 minutes free consulting personally with Nicholas; by e-mail if he is out of the country lecturing or doing research; or we will send you his phone number if he happens to be in residence in Missouri. To obtain this free consulting, simply purchase all four series, digest them, and then contact Dr Hellmuth to ask your questions. If you prefer to fly Nicholas to your location, we do consulting on giclee, fine art photography, digital photography, workflow, decor, all around the world, including ateliers in Greece, Turkey, Hawaii, Canada, and in the US. If you want professional consulting (an entire day, or two days), then please download the FLAAR info sheet on consulting. We also consult on UV-cured flatbed printing, eco-solvent, solvent, mild-solvent for decor and interior decoration. Business plan for starting or improving a fine art giclee printing service., Update March 2007, price: $120.00, 46 pages. A comprehensive glossary of fine art giclee terms, Update February 2005, price: $120.00, 13 pages. Giclee Site-Vist Case Study of a Succesful Giclee Studio, Update February 2006, price: $120.00, 11 pages. How Much Profit Can You Make Printing Giclee, Update July, 2006, price: $120.00, 7 pages. Inkjet printing for creatives, designers and artists (all levels, beginners, intermediate, commercial production), Update January 2004, price: $120.00, 13 pages. Opportunities in the DE9cor Market for Wide Format Inkjet Printing, Update February 2006, price: $120.00, 12 pages. Clear coating liquid lamination; painting on top of inkjet prints, Update February 2003, price: $120.00, 9 pages. 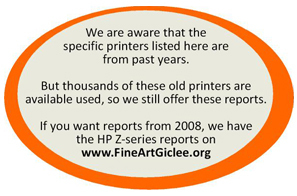 Comprehensive Workflow for Fine Art Giclee Printing, Update February 2005, price: $120.00, 19 pages. Ink and media for fine art giclee and photo realistic, Update May 2003, price: $120.00, 22 pages. Selecting Equipment, Hardware & Software for Professional Giclee, Update July, 2006, price: $120.00, pages. Details on using Digital Reprographic Cameras for Fine Art Giclee, Update November 2002, price: $120.00, 17 pages. IV: Repro Stands and Copy Stands to Photograph Paintings, Historical Maps, Drawings, Posters, Update January 2005, price: $120.00, 25 pages. Options for Photographing Paintings to reproduce as Giclee Prints, Update May 2003, price: $120.00, 22 pages. Part I: What Entry-Level Camera to Use to Photograph Paintings, Maps, Drawings, Posters So you can print this art as Giclee, Update January 2005, price: $120.00, 9 pages. Part II: Using Medium Format Digital Cameras for Giclee Digitization, Update January 2005, price: $120.00, 11 pages. Part III: Using BetterLight or other Large Format Digital Camera to digitize Paintings for Giclee, Update January 2005, price: $120.00, 11 pages. Part V: Photographing Paintings, Historical Maps, Drawings, Posters, Update January 2005, price: $120.00, 18 pages. Part VI: Can you use Wide Format Scanners To Digitize Paintings for Giclee?, Update January 2005, price: $120.00, 15 pages. Scanners: what Scanners are best for Digitizing your Paintings or Artwork so you can print them., Update January 2005, price: $120.00, 37 pages. 24" Wide Format Printers for Giclee, Update January 2005, price: $30.00, 13 pages. Recommended printers at 11"x17" and 13"x19" sizes for giclee, Update June 2004, price: $32.00, 8 pages. Epson 4000 Setup and Installation, Update March 2005, price: $25.00, 7 pages. Epson Stylus Pro 7600 with UltraChrome Ink Evaluation & Review, Update January 2004, price: $35.00, 24 pages. Epson Stylus Pro 9800, Update July 14 2006, price: $90.00, 10 pages. Giclee on Canvas and Watercolor Paper, Update March 2004, price: $40.00, 13 pages. Iris 3047 giclee Printer Evaluation, Update January 2005, price: $50.00, 13 pages. Site-Visit Case Study of the Epson 4800, Update July 2006, price: $90.00, 15 pages. Wide format inkjet printers for fine art giclee, Update January 2006, price: $40.00, 51 pages.